When I was pregnant, I took a Calm Birth class that was offered through my hospital. I wanted an unmedicated delivery, so I vowed to use all of my resources to do what I could to make that happen. While I wouldn’t describe my rushed delivery as at all meditative, the class did make me a believer in meditation. My husband and I went home from our first session and slept like babies (the ones who sleep through anything, not the ones who are up all night). I also kept practicing regularly, and loved the connection I felt to my baby. So when I came across this article about meditation for expectant moms, I wanted to ask the author a few questions myself. Today, Linda Lauren, fourth generation psychic medium and author of Medium Rare, shares some of her meditation tips and exactly how meditation can help you during pregnancy and labor! 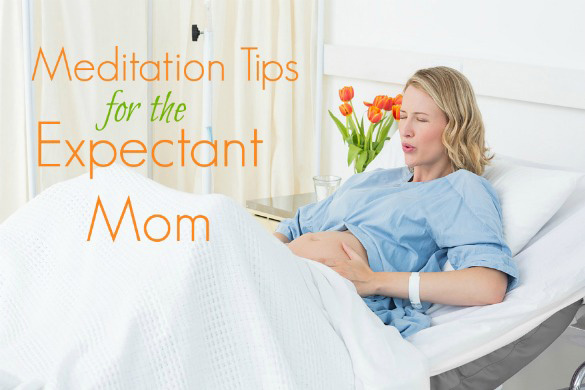 How can meditation help prepare a mom for labor? Meditation is a key factor in preparing an expectant mother for labor because it works in companion with any of the breathing techniques available in prenatal care like Lamaze. It also gives the mother power over how she deals with hormones and mood swings and can help physically reduce blood pressure, which is often a concern during pregnancy. Any tips for labor itself? Aside from being prepared in advance in terms of what you will need for your initial stay, I would be sure to choose colors the mother makes her feel calm and happy. I would also suggest that she pick music that makes her feel good and play it on the way to the hospital, all the while breathing slowly. Let that continue through to delivery room, and it’s not unusual to ask your doctor in advance to play that particular music while you are in delivery. How does meditation benefit expecting moms in particular? Any benefits to the baby? The biggest benefit is the control of hormones. This is often thought of as a spiritual time for a woman to bond intuitively with the baby, and the act of relaxed breathing allows her to respond to life with reason instead of being at the mercy of emotion, which is brought on by reacting. The stillness helps with depression and worry, and allows for a more levelheaded response to pregnancy. The baby will love the internal peace he/she experiences with you during meditation. If anything, meditation strengthens their connection because this is all the baby will know until it’s born. For someone who has trouble clearing their head, can you recommend a few mantras that are good to repeat or think as you meditate? I often counsel my clients to find a word that is comfortable to remember and reminds them of the intention of their meditative time. Words like love or peace are good to focus on in a silent, mindful breath while meditating. My favorite suggestion is for the mother to focus on the baby inside her by using most of her senses. Placing her hands on her belly and “listening” to the beat of the heart, meanwhile paying attention to any kicks or demonstrations of “feeling” that come from the baby at her touch. Just following the breathing, loving life force of your baby will most likely put you in a pleasant trance where the two of you get some well-deserved alone time together! As a P.S. on the fun: get a stethoscope at the local pharmacy and let the baby’s breathing and heartbeat be an even stronger “mantra” to meditate with.